Image example Bobi Wine say police no get any right to ban am to dey perform for concert. Police for Uganda no wan gree give Bobi Wine chance to perform for one concert wey im be di main performer onto say im talk some kain things wey fit ginger fight. Police dey accuse Wine wey be musician wey turn politician, say im talk di statement when im dey perform for one former concert wey dem call Busabala show. Police don dey investigate di matter. Wine say na from music im dey make money and police no get any right at all to ban am. Na local media for Uganda dey report dis one. Bobi Wine wey im real name na Robert Kyagulanyi na lawmaker for Uganda. 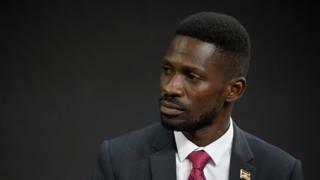 Since dem elect am for parliament, Bobi Wine no dey ever gree with di ruling party wey be National Resistance Movement. Na im be di main person wey dey against one plan to comot age limit for presidency. As e be now, di presidential age limit na 75 years. If di plan work, di current president Yoweri Museveni go fit contest again for 2021.